The traffic noise increases markedly approaching North Grove Lock with the M25 looming in front and spanning the canal along an awesome concrete viaduct. Onward to Lock 70 and Home Park and most of the traffic noise disappears, useful for a good night’s sleep at the long term mooring. After Kings Langley Lock you begin to approach Hemel Hempstead with football pitches, lakes and warehouses. Now you cross the busy road bridge at Nash Mill Bottom Lock 69, pass the Red Lion and move onto the Top Lock where there was a branch to the mill. Apsley was paper making town and there’s much new development to be seen up to and including Apsley (Dickenson Quay) Marina where there’s Woody’s vegetarian restaurant and the Paper Mill pub next to Apsley Bottom Lock 67. 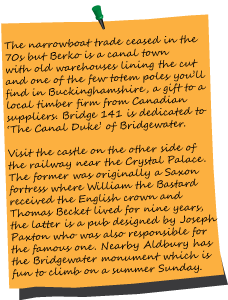 Between here and Lock 66 there were arms to Apsley and then Frogmore mills. A brightly painted footbridge now takes you to the other side of the canal and then onto Apsley Top Lock 65. This is now quite a pleasant stretch albeit with background traffic and you move onto Boxmoor with its church, cricket pitch, meadows and the Bottom Lock. Boxmoor Wharf was the area's commercial centre for many years, the last regular narrowboat trade on the whole of the Grand Union was the West Indian lime juice run to Rose's that finished in October 1981. It’s best not to dwell on Hemel Hempstead. The Fishery Inn stands next to the canal on Fishery Road adjacent to Fishery Bridge near to Fishery Wharf and not far from Fishery Cottages. From there the canal follows the familiar railway and the River Bulbourne. After going underneath the rails all you hear is the A41 on your way to Winkwell Dock. Walking between the canal and the river you reach a swingbridge to the Three Horseshoes at Winkwell Top Lock 60, there's a ten shilling fine if you're on a boat and don't close and fasten it. After Bourne End Bottom Lock, the A41 is barely audible and the country is pleasant if not notable. At the quaintly named Sewer Lock the canal renews its acquaintance with road and rail but remains unremarkable past Bottom Side and Top Side Lock. The approach into Berkhamsted starts around here, crossing to the other side at bridge 143. 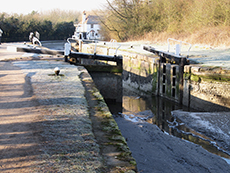 Two pubs are in close proximity welcoming you to the ‘Port of Berkhamsted’ - whose main trade was all sorts of wooden goods including hundreds of lock gates - the Rising Sun next to Berkhamsted Bottom Lock and then the Boat at Ravens Lane Lock. Cross the Castle Street turnover bridge and you reach what was once described as a ‘vast plot or moore lying by the river’. There’s plenty of anglers here and they are also much in evidence after Lock 53 near willow lined moorings. From under the modern wooden bridge, Locks 52 (Northchurch Bottom Lock) and 51 (Northchurch Lock) indicate that you are leaving Berkhamsted behind although suburbia continues until bridge 139 and Northchurch Top Lock (49). In part due to maintenance but more seriously low rainful at the Marsworth reservoirs, there is now in places a distinct lack of water between here and the Tring summit. Rail and canal become friends again but it’s quiet countryside with not a lot to get excited about. Cross over at Lock 48 and there’s nothing much except a field with donkeys until the award winning Cowroast Lock boasting a sanitary station and marina, visitor and long term moorings. The Bulbourne river rises at Cow Roast and is a major contributor to the canal, at times they are interchangeable. We are now at the start of the 3 mile long Tring Summit and following Cow Roast the canal passes through the one and half mile, 40ft deep Tring cutting completed in 1797, slicing through the countryside between the town and its station. The cutting has a surreal feel, dark with shafts of sunshine and tranquil with the periodic popping of a diesel engine. At bridge 132 cross to the other side of the canal where there are visitor moorings. The cutting ends before you get to bridge 133, the Grand Junction Arms and the start of the Wendover Arm at Bulbourne Junction. From here until the reservoirs at Marsworth, the lack of water is as clear as the rainwater the canal so clearly lacks. The locks have padlocks but this is hardly necessary as they have no water. Certainly not the 50,000 gallons needed each time a boat goes through. The four reservoirs were constructed purely to supply water to the canal. The towpath passes first the Marsworth, built in 1806 with an area of 24 acres and holding 55.5 million gallons, and then Startop’s End, constructed in 1817 over 26 acres and with a 106.5 million gallon capacity. The largest is the Wilstone reservoir which covers 119 acres and the smallest Tringford at 20 acres. This is a lively little place with a dry dock and a small iron works and it is where the Wendover Arm leaves the main line. It was initially envisaged to feed the Grand Junction with water from the Chilterns’ chalk streams but by 1897 it was clear that it was leaking more than it was supplying and actually taking water from the main canal. So the decision was taken to abandon it. Recently a Trust has been successful in restoring the first one and half miles of its 6.7 mile length.